Is iPad a game changer for e-books? Posted on January 30, 2010 under Technology. 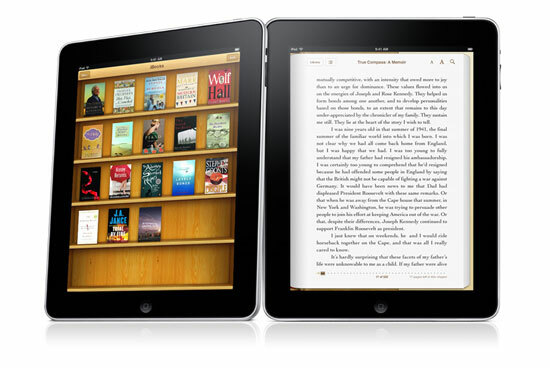 Apple’s iPad which released a few days ago promises to change the way we read digital books. Armed with a 9.7” touch screen display, it certainly looks capable of doing so. In comparison, the e-ink powered readers, like Kindle, look like black and white silent films in a color talkie era. But will the iPad really deliver on its promise? Well there is no easy answer to that. I think it falls somewhere between yes and no. While a number of commentators and analysts have been raving about how the color screen is what e-books have been waiting for, I think they are missing the point that most of the books published are predominantly black and white. So having a color screen isn’t really going make that much of a difference for standard fiction and non-fiction books. It’s true that you are going to get fabulous 3-D page turns, page backgrounds and all that other jazz, but given a choice between charging a device after reading say a book or two (10 hours) to practically charging the device once or twice a month, I think I would prefer e-ink any day, more so if I was going to use the device only as an e-reader. (In spite of the perceived shortcomings of e-ink devices that the press keep raving about) . What’s going to really matter is readability – meaning how long can you read off the screen before your eyes tell you it’s time to do something else. Having read extensively off LCD monitors in the past, I know how painful it can be to read for long on normal screens. E-ink on the other hand remains a pleasure to read from, and so far I have had very low eye fatigue. So what remains to be seen is if the iPad’s LED display will match up to e-ink in terms of readability. I also think that the iPad’s higher weight is going to pose a problem in curling up with the device to read on a lazy Sunday afternoon. I don’t know if it’s going to be possible to hold the device in one hand (like a book) and read for extended periods of time. In fact many people already complain that they have problems doing this with the considerably lighter Kindle. Lastly, Apple has an uphill battle to get quality content for its device. It’s the one area where Amazon has a stranglehold on the market and it’s one of the most important reasons for Kindle’s runaway success. Of course, all this only matters if Apple intends to make its iBook platform a success. If it merely intends to drive device sales through books, then it probably would be better off surrendering this battleground to Amazon. Amazon’s Kindle app for the iPhone (and now hopefully iPad) already has access to 400,000 Kindle titles and its adding a lot more to the list every day. Now that I have brought out the areas where I think the iPad could have trouble in, let’s look at the areas in which the iPad can be a game changer. For starters, looking at the wonderful color screen of the iPad, the first thing that comes to mind is comics!! Imagine reading your favorite DC or Marvel comic on that screen or curling up with your favorite graphic novel on the iPad. I think this is the one area that Apple can seriously make its own. Currently, digital comic book distribution is in its infancy. It’s a market without a tested delivery model as yet. Thanks to this, there is a burgeoning shadow file sharing market, especially for out of print comics. Die-hard fans have often scanned entire comic book series in an effort to popularize their own forgotten heroes. However, due to the colorful medium of comics, this hasn’t yet translated to the B&W e-book readers. This means that with the right kind of tie-ups, Apple can possibly do for the comic book industry, what it did for the Music Industry with iTunes and the iPod. I think reading comics on that big piece of glass is going to be a great experience. With multi-touch, navigating multi-panel scenes is gonna be a piece of cake. By extension, as has been repeatedly pointed out, Apple can also make new ground in areas where color and layout are of paramount importance such as magazines, newspapers and textbooks. These are the type of books that will never translate well to the e-ink screen. They are also the kind of books that you would not ordinarily spend hours reading from (I know, what student wants to spend time on textbooks, right? ;)). This means that readability isn’t likely to be such a big issue for this kind of material. What will matter however is how Apple chooses to allow interactions with these kinds of books to take place. While active content embedded in newspapers, such as video clips and podcasts are a no-brainer, it would be really something if Apple lets users scribble notes on the screen, or highlight and underline important text. Besides this, I feel that those of kind of books are also the ones for which Apple can get away with setting a much higher price point. Currently, thanks to Amazon’s aggressive pricing policy, customers have become habituated to $9.99 or less prices for fiction. In fact some of them have gone as far as to say that they wouldn’t buy anything priced higher. However, I think Apple might be able to get away with charging much higher prices for the kind of books that I mentioned, if it can deliver enhanced value on the back of its apparently superior technology. In the end, like I mentioned in an earlier post, the iPad is a flawed device that does have tremendous potential and I guess time will tell if Apple plans on addressing some of the shortcomings of the iPad. This entry was tagged under: apple, E-Book Readers, E-books, iPad. Both comments and pings are currently closed. I love this idea of digital books. For the most books are something you love you can hold it in your hand. you feel like you you have spent your money and have something in your hand. but as time moves on more people are opening up to the idea that digital books could be the next best thing. and hey why not? This I believe will be the next big thing happening with book. and I think over time to amount of people will open up to it. but just give it some time.